I have woefully neglected my strawberries this year. The strawberry bed was dug, weeded and hoed to a fine tilth and the original strawberries were planted in two rows about 30 inches apart. They were planted along the rows with the plants spaced about 12 inches apart. Some years I have dug them up and raised the rows so there is a trench each side. You can also grow them in pots, hanging bags or baskets. Some years I have fed them with tomato feed every two weeks. When I had my horses, I used to bring some of my straw home which I tucked around the strawberries. This keeps the fruit off the wet soil, suppresses weeds and (hopefully) keeps the berries out of reach of slugs. Since then I have experimented with making cardboard collars for each plant – time consuming, not sure if it was worth it. One year I moved a mixture of old and new plants to a different area. I laid weed suppressing material over the prepared ground and planted them through this. The experiment was not a great success and I did not have a huge crop in the two years that this material was down. Although I followed the same watering regime, when I took the material up, the ground seemed to be very dry underneath and I wondered if this had been the problem. Squirrels and birds love to eat my strawberries. Once the fruits start to ripen, I normally net the strawberries. I lay the net over the plants and secure it to the ground with a mixture of pegs and a ready supply of old bricks (saved from where our front wall fell down one day in a passing hurricane). It is my ambition to buy a fruit cage. Every year as I painstakingly remove the nets to pick the strawberries and then fasten them down again, I decide I will buy one. Then every year I forget to do it. This is advised to avoid disease. The only time I moved some plants to a different area was a complete disaster. My original strawberries have been happily cropping in the same area for the past twenty years. I never do this and the strawberries are fine. If the runners appear during the fruiting season, I cut them off and throw them away. This is the equivalent of deadheading: the plants need to put their energy into fruit, not into making runners. When the fruiting season is over, I let the runners grow. You are supposed to pin the runner to the ground so the plants can root, and only use the first plant on a runner as it will be the strongest and discard the rest. When I first started growing strawberries, I couldn’t bear to throw any of the baby plants away. If I had to dig any up, I potted them and forced them on my friends and family to plant in their gardens. What I do now is abandon the strawberry patch after fruiting and leave the runners to do what they like. Later in the year, I come back to the strawberry patch with my secateurs. I ruthlessly cut the runners and drag out lots of runners and baby plants and chuck them on the compost. I then survey what is left. I thin them by pulling out a mixture of new plants and old. I dig out plants and split them. (My rows have now been abandoned.) Sometimes the leaves get brown patches. I cut all the old leaves back. If they are diseased, then don’t put them in the compost – dispose of them. In the spring I reassess the strawberries and thin out more if necessary and again, I cut back any dead leaves so the new fresh green leaves can come through. Then I just keep weeding every week and wait for the new fruit. For various reasons I haven’t been able to weed my strawberries at all. The patch is completely choked with weeds. I haven’t been able to net them as we have fox cubs in the garden who spend the evenings playing on the vegetable patch, jumping through all the plants and weaving through the runner bean canes like dogs on an agility course. I can’t risk the cubs getting tangled in the nets! Stewed strawberries are delicious. Stew them with a little water and sugar, then eat them with ice-cream or cream. Forget apple tart, put your stewed strawberries in the tart instead! Forget plum crumble, put your stewed strawberries in the crumble instead and serve with cream, or ice cream! If you have any strawberries left over or not quite up to standard, make a jam. 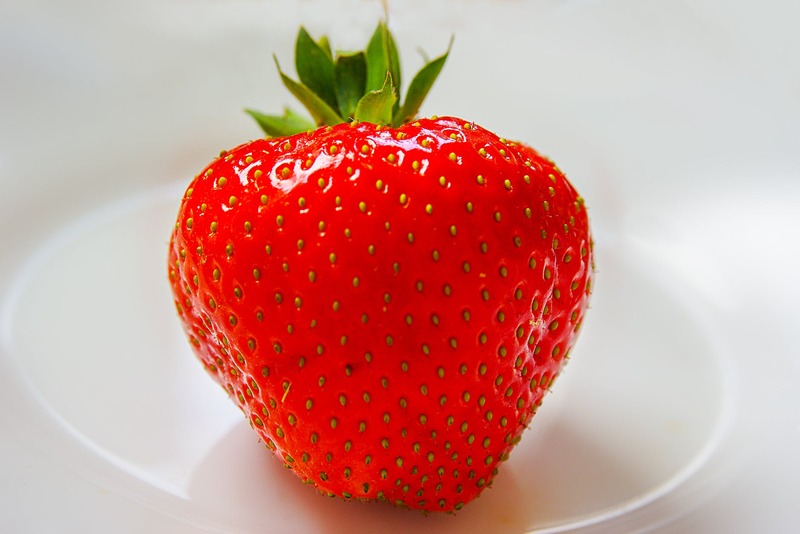 Plant some strawberries in your garden, and have a tasty summer! Previous Last Chance to Save the Bees? i think i didnt water mine enough, that they didnt live too long. hope to try again. waiting for them to be available at the garden store. great post! Yes, I think they need a lot of water!